Looking back at Draft Weekend 2017, the Buffalo Bills did an excellent job. When you figure that the draft was being run by a new Head Coach and the scouting department was day away from being disassembled, the draft may even be remarkable. Tra’Davious White, Zay Jones, Dion Dawkins, Matt Millano and Taneer Villejo should all contribute in some way. Players like White, Jones and Dawkins should all become starters at some point during the season if not from opening day on. The player who may not play much this year but in two to three years could be considered the key play in the 2017 Draft is quarterback Nate Peterman. The Bills may have drafted Peterman in the fifth round, but I felt that he could have very easily been selected in the third round and it would not have been a reach. I had Peterman rated as the fifth best quarterback in the Draft. I had him ahead of players like Davis Webb, C.J. Beathard and Josh Dobbs who were all drafted higher. Why? His overall talent, his upside and his intangibles. When you are scouting and drafting quarterbacks it is my feeling that if you don’t believe the player has a chance to become a starter in the NFL than you are wasting your time drafting the player. Peterman not only has the talent to become a starter in the league, but a consistent winning starter. Peterman ran and NFL style offense at Pitt, an offense that required to him to play from under center and make full field reads. In many college offenses, the quarterback isn’t allowed to change the play at the line of scrimmage, if a change is made, it comes from the coaching staff and signaled in. That was not the case with Peterman as he was allowed to call audibles and change protections. Peterman is a very smart and instinctive player and he has a very good ability at his young age to read defenses. On top of that, he is very poised and calm in the pocket. Put it all together and he has shown the ability to be a very good decision maker and he doesn’t turn the ball over. 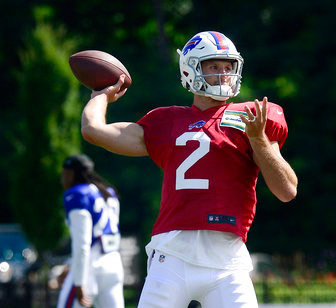 Physically, Peterman has the tools to be a good NFL starter. He is just over 6’2 and weighs 225. While he isn’t a burner at 4.82, he has quick feet and good change of direction to go along with a good feel for pass rusher. He can extend plays with his feet and throw on the run. Peterman has good not great arm strength and throws a tight ball. That shouldn’t be a problem as most quarterbacks show an improvement in their arm strength after they reach the NFL. Examples of that are Payton Manning, Drew Brees and Tom Brady. All of them improved their arm strength dramatically after reaching the NFL. Peterman has good accuracy but it is an area where he still needs to show some improvement. This can be done with coaching and practice. What he has that is difficult to coach is an exceptionally quick release. When he makes his decision to throw, the ball is out of his hands very quickly. Peterman, intelligence, leadership and work ethic are what will make the difference for him with the Bills. He is a quick study who will pick up the new offense in quick order. The natural leadership skills he has will allow him to communicate with confidence with his teammates. As he gains experience that will only improve. It goes without saying that 2017 is a pivotal year for current starter Tyrod Taylor. He has to show the new coaching staff that he can run their offense, lead his teammates and win. I have seen enough of Taylor over the years to feel he is not more than a marginal NFL starter. His size limitations and instincts hurt his ability to improve. In the long run that will help Peterman. The best thing for him as a rookie is to sit and learn while the coaching staff evaluates what they have in Taylor. In another year, Nate Peterman will be ready to lead the Buffalo Bills.